Hello there, lovebirds! And Happy Valentine's Day to you all!! I have a special meal to share with you today. It's really easy, delicious and a perfect "romantic" dinner! So I'll first have to admit that up until a few years ago I was not a huge fan or mussels. Or scallops. Or clams. There was something about them that kind of creeped me out. I couldn't tell you why, but they definitely were not on my "Top 10 Favorite Foods" list. Not even top 100. I don't know what it was, but I tried﻿ them again recently and actually enjoyed them! I know I read somewhere that your taste buds change ever 7 years or so, and I definitely believe that. They're really delicious since they take on the flavor of whatever you cook them in and they're so easy to cook, too! They would be perfect for a nice, quiet, romantic meal on a day like today! Chris had told me previously that one of his favorite meals growing up was when his mom made mussels with marinara. I had some leftover marinara sauce in my freezer, so I decided to try to recreate this. Now, I'm sure it's not as good as his mom's, but I still thought it was pretty darn good! Especially served with some nice, crispy bread. Yum! Hope you all have a wonderful Valentine's Day! Heat marinara sauce in large skillet. Add red pepper flakes and cook until hot. Meanwhile, rinse mussels off in cold water until clean. 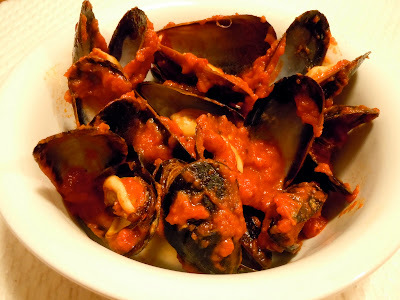 Drain water and add mussels to marinara mixture. Cover and let cook for 10 minutes. Uncover and discard unopened mussels. Mix with linguini and serve.